This is a project that actually started in 2002. 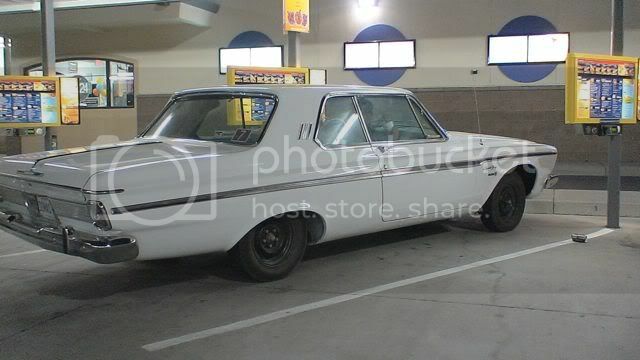 This 63 Sport Fury was parked back in 73 after my Aunt Donna was tragically killed in a bad accident, she bought the car new in 1963. So it sat for 30 years untouched until my Dad decided it was time to restore his sister's car. My Grandfather and Grandmother had pretty much made it a "hands Off" item. 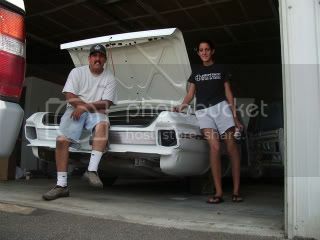 So here's a shot of us backing it out of the barn/garage back in 2002 just after my Grandmother pasted away. It was filled with rodent crap and acorns and the motor was froze. I just wish I would have had more pictures of it in this condition. This next shot was taken some time in the same year (I think) and my Dad had it ready for Paint. The pic says 98, but I'm sure it was sometime in 2002,,camera must had been screwed up. And, here's a shot of my Dad in June of 2004, The 361 had been rebuilt and was now running and it had just come out from the Paint shop. Sadly my Dad had also come out of Exploritory surgery just to find out that he was not only battling colon Cancer, but had grave complications to the newly discovered Pancreatic Cancer. That's a nice car. Sorry about your dad's health problems. Nice project, hope it continues. Would love to see more pics. Sorry to hear about your Dad, Great story, hope the rebuild continues. Sweet car, it'll be all worth it in the end, but sorry to hear the health battles. Beautiful Car, Enjoy every moment behind the wheel that you can. Shiny. Lets be bad guys. 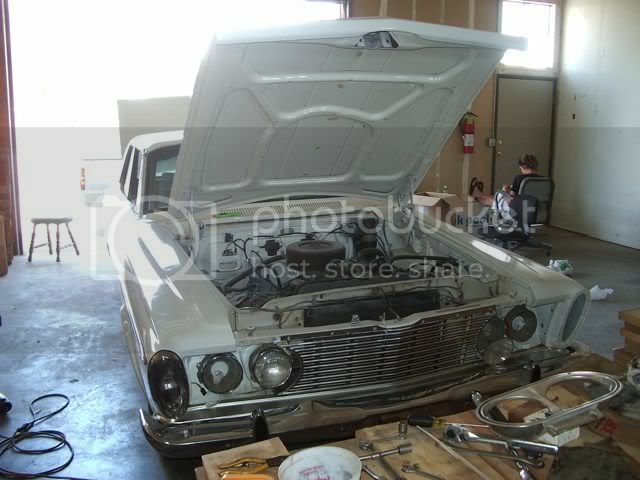 So I think I left off with myself heading up to No Calif. to help my Dad put the chrome back on the Fury. My youngest daughter was up there as well and she took up the job as Chief Chrome Polisher. It was pretty obvious that my Dad would not be helping me due to his health issues. One day he did make it over to the shop to check on the progress and to give me some pointers,,,little did we know. 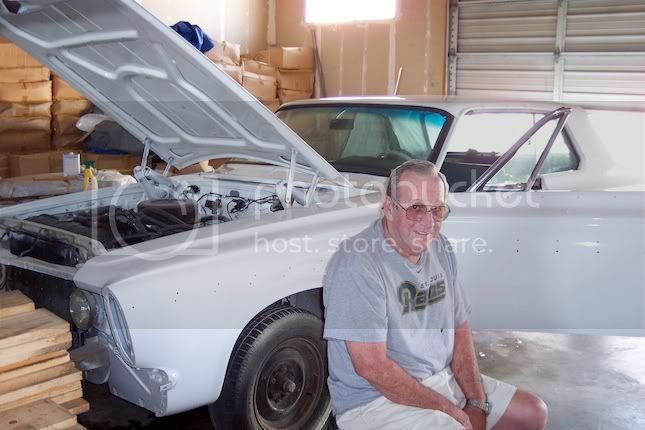 That Hot July day was the last time he'd see the car,,,he passed away August 24th 2004. 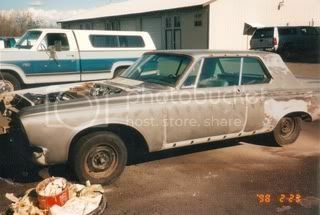 Days later my Uncle said to me "Donna's Car (the 63 Sport Fury) is now in your hands"
My Daughter Cassie and I working on the Car. Someday it will be her car. The shop were she came back to life. Her first Cruise to a burger joint in over 30 years.